As the creators of park experiences, how can we better engage with children and families and encourage greater use when designing paths and trails? For the second year, NRPA and Disney issued that challenge to park and recreation agencies across the country and sought innovative ways to introduce fun and play to help children and families be more active. Through the Meet Me at the Park play spaces grant program, now a total of 50 communities have been selected to receive grants to support projects that are increasing access to play and physical activity in local parks for children and families. This program is part of NRPA and Disney’s commitment to provide 1 million kids and families with greater access to play, and some of these innovative spaces are using paths and trails as the backdrop. In Baltimore, Maryland, home to the third-largest urban wilderness park in the United States, the Carrie Murray Nature Center, Friends of Gwynns Falls/Leakin Park and many volunteers have created a fun way for families to feel safe hiking along an urban wilderness trail. The wilderness park is surrounded by 22 neighborhoods within walking distance, but unfortunately, many young families are reluctant to enter the forest because of safety concerns. The answer to helping people feel comfortable was a simple, but exciting idea. Stretch a nature play space along an easy loop trail with a “bread crumb” method of enticing families to try out a new experience with hands-on nature activities. The intention was to cause as little disturbance to wildlife habitat as possible and create play areas from natural materials. Dangling wooden logs become a xylophone, blending into the surrounding environment. In a less “urban” forest, Kitsap County Parks in Washington has created an adventure trail for kids and families to discover and explore the forest around them. This new trail experience provides opportunities for kids and families to learn about native plants, tree species and wildlife habitats and to develop outdoor adventure skills, while offering insights on the workings of a forest environment. 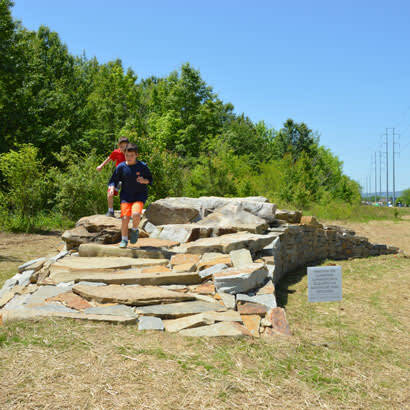 The city of Chattanooga, Tennessee, is welcoming adventure seekers to a new trail at Sterchi Farm Park and Trailhead, the city’s first environmental art piece. The new adventure section is directly off the multiuse path near the Sterchi Farm trailhead and features several ramps users can walk, climb, ride or run across. Several of the obstacles feature challenging objects spanning two ramps to traverse, such as repurposed logs. Life-sized dinosaur replicas are the focus of a healthy initiative project at Gwinnett County Parks and Recreation in Georgia. The dinosaurs are finding new homes in county parks and along greenways to encourage kids and families to get outdoors and explore public lands. Educational signage providing interesting facts about each dinosaur and programs, such as scavenger hunts and guided walks, will be a great incentive to search for and discover the creatures, particularly for families with young children. After the first year, the county will assess the program and decide if the statues should be moved to different park locations to create new attractions for dinosaur enthusiasts. A path or trail can provide a perfect setting for people to be active and connect with nature. When helping to inspire kids and families to get outdoors, trails and paths can also be the location where they explore, learn and play. Through the Meet Me at the Park play space program, new opportunities for kids and families to experience the benefits of play are being created across the country. Play space projects that focus on making trails and paths more fun and engaging are encouraging greater use of those places for play, physical activity and so much more. Marla Collum is NRPA’s Senior Manager of Programs.